The company CIRIGLIANO S.A., located in the city of JUNÍN, is specialized in Ventilation Engineering. It offers to the market axial, helical and centrifugal fans for industry, mining and agriculture sectors. 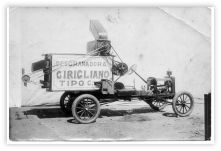 Don Pascual Domingo Cirigliano with a smithy and a small furnace performs repair works of agricultural machinery and manufactures spare parts. He starts manufacturing bombs to extract water, brass cylinders and valves, among other things. Mr. Pascual manufactures internal combustion engines for bicycles. The direct contact with the grain begins with the manufacture of machines to thresh corns on a Ford "T" chassis and flamethrower machines to kill lobsters. Domingo Pascual Cirigliano marries Ramona A. Fittipaldi. From the Marriage 4 children were born: Lidia, Alciro, Anibal and Eduardo. A floored oven is annexed. 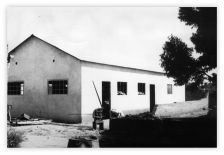 Mr. Pascual manufactures a line of family firewood kitchens, lavatories, sinks and toilets, for the Pacific Railroad (BAP). 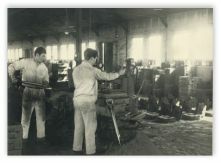 Mr. Cirigliano prepares for Jorge Stephenson School, teaching materials for machinists and school students, helping to the development and training of the staff, in charge of the driving steam locomotives. Mr. Pascual starts manufacturing electric motors to be applied to pumps and pumpers, built entirely in his factory. The concept of manufacturing the entire product emerges and Mr. Cirigliano provides extended warranty thereof. The first contact with the firm: The Anglo Argentine General Electric Co. Ltd is established, which is interested in Cirigliano´s production line for its commercialization. An agreement is signed to manufacture the products brand GENALEX in exchange for GEC engines. 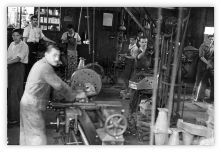 The war brings to America supply problems of electric lamps and Mr. Pascual turns on a battery of furnaces for glass, producing lamps, which then would process GEC in Buenos Aires, material levels of boilers, optical glass, etc. 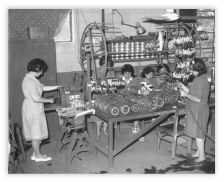 Mr. Pascual manufactures machines for forming glass optical lens (one of the machines is exhibited in the museum). His daughter Lidia is incorporated in the administrative area of the company. Cirigliano starts manufacturing fans and air extractors GENALEX and launched to the market the windmills SAMSON, manufactured by the firm J.F. Macadan & Cia. S.A. and the entire line of gouaches, Australian tanks, drinkers, auxiliary pumps, cylinders and filters for mills. His son Alciro is incorporated in the Production Department of the Company increasing the production of fans and air extractors. The first fixed blade axial fans are manufactured. Anibal, his son, is incorporated collaborating with his brother to increase the production. Invited by GEC, Mr. Pascual Cirigliano travels with his wife to Europe to visit the factories that the company owns in England. This trip performed by the firm WOODS OF COLCHESTER Ltd. granted the license to manufacture in our country its line of axial fans with aerofoil section blades and variable pitch. During the trip they visit Spain, Portugal, Italy, Switzerland, France and Belgica. His son Eduardo dies in an accident. Cirigliano introduces the manufacture of engines operating with permanent capacitor, installed in silent air extractors, with fractional powers. Pascual Cirigliano retires from the company and forms a partnership with their children under the name: INDUSTRIAS ELECTROMETALÚRGICAS CIRIGLIANO SCpA. The first mufflers are launched to the market for axial fans. The company manufactures for the company GEC traffic lights in the Federal Capital City and in the provinces of the country, under the brand GENALEX. 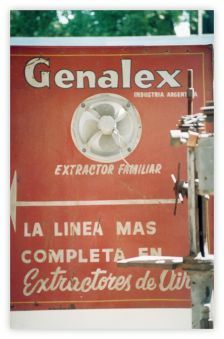 The company manufactures light fixtures with mercury vapor GENALEX brand. The production line of engines for direct drive fans is completed, up to 12 poles. Fan control test facilities are improved and advanced instrumentation is incorporated. Under British Standards an advanced method of flow control, pressure and noise level of the fans installed in series. Mr. Alciro Cirigliano travels to England. He is trained with the latest manufacturing techniques and advances regarding ventilation systems, applied to agriculture, by WOOD OF CLOCHESTER Ltd.
Mr. Anibal Cirigliano establishes the Agriculture Department and develops ventilation systems for the storage of grains and seeds. 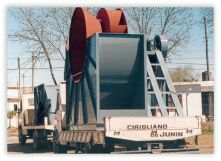 The staff of Cirigliano is trained to manufacture the equipment with the application of standard fans. The first "ventilation Practice Guide" designed to guide the farmer is published. In October, Mr. Pascual Cirigliano passes away. The company introduces to the market drying systems for sausages, noodles, fish, fruits, wood, among others. The company develops and manufactures the line of centrifugal fans to be applied to air conditioning systems. Implementation of the use of seven types of blades with different applications per fan. Mr. Alciro and Mr. Anibal travel to England to attend a course in ventilation engineering and its applications in the company WOODS OF COLCHESTER Ltd.
Mr. Sergio Cirigliano is incorporated in the Technical Department of the company. 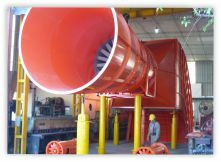 The company develops high pressure blowers for furnaces and pneumatic transport and axial fans with pitch adjustable blades for ventilation systems. The company starts the construction of an anechoic chamber to improve the facilities of sound tests. As of December, the company starts running as a Corporation. The first directory is as follows: President Ramona A. Fittipaldi de Cirigliano, Vice President Anibal M. Cirigliano, Directors Alciro V. and Lidia C. Cirigliano. The project on fans with pitch adjustable blades in operation is performed, approving the final prototype and its standardization. The Company develops a wind tunnel for the operation of a laser beam with the assistance of engineers of the Engineering Department of the University of Buenos Aires. The company puts into operation the computer center with the acquisition of a hardware, developing softwares for the application to the scientific calculation. The first Varofoil are built and standardized. The company continues manufacturing the wind tunnel for the laser beam preparing the final details. The Operating System analysis is performed in all areas of the company to design the Software which allows the full use of electronic data processing. The company improves the electronic processor operations in the administrative area. The company negotiates with the Municipality of Chacabuco to install a new plant in that city. Mr. Gustavo Cirigliano is incorporated in the sales offices located in the city of Buenos Aires. The company operates with safety stock in major items, filed in computers to combine the information with the Cost Center. The agreement with the Municipality of Chacabuco is signed. New fan tests are performed with guide vanes for Mining in the auxiliary fans line. 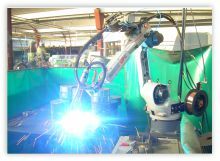 The company starts performing repair works on the new plant. The Lic. Sergio Cirigliano visits exhibitions held in industrialized countries (such as Germany, France) to incorporate the latest technology in mould tools and equipment. The company located in Chacabuco has an area of 36,000 m2 and 6,000 m2. In Junín the company has an area of 9,500 m2, from which 7,080 m2 are covered. 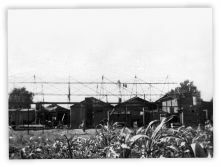 Improvements in the new plant are performed. The company installs transfered machines from Junín in the new plant. Storage and drying cells are built in Chacabuco for dynamic demonstration. Tests are carried out in the maintenance of seeds in bag and bulk. The company is recommended by the Argentine German Chamber of Commerce for its career to ebm Mulfingen, Germany. 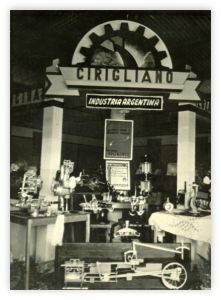 Cirigliano S.A. was chosen to exclusively represent in Argentina the company ebm and its associated companies. The Lic. Sergio Cirigliano travels to Germany to sign the agreement and takes a course taught by Eng. Wagner, together with the agents of Brazil. After an inspection by the ebm Engineering management, they authorized the manufacture and assembly in the country for ebm products, for distribution and sale. Mr. Aníbal Cirigliano travels to Germany and Italy and brings new technology for the manufacture of fan grids. The company starts manufacturing tools for diffusers and mounting brackets of ebm products online. The company starts manufacturing assemblage protective fan grids to be used in the refrigeration line and others. Storage techniques are improved and grain static and ecological drying in modular portable cells achieves large storage capacity. Mr. Aníbal Cirigliano travels to Italy, visits the factory of punching machines RAINER of the GASPARINI folding machines and factory fans for welding fume extraction. 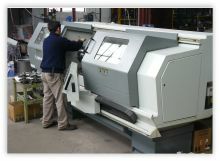 The company purchases a CNC punching machine RAINER 2000. The company launches the 2000 SERIES of centrifugal fans built with the CNC punch RAINER 2000. CIRIGLIANO S.A. contacts WALINGA INC, company located in Canada. A last generation computer mechanized software program for RAINER 2000, CADCAM, is incorporated. Hence, our personnel receives specialized training courses. The possibility of manufacturing the pneumatic grain transfer machine is considered since it complements the storage cells and drying. External rotor motors are introduced in the market. We receive the visit of the president of Walinga Inc., Canada. 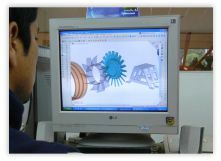 A new software, the Solid Works is acquired: modeling and design in three dimensions, calculation of materials, structures, among others used in automotive and aeronautical factories. New fans for mining were developed. The Lic. Sergio Cirigliano travels to Canada and agrees the manufacture of WALINGA model 5614 (pneumatic transfer machine), under license. The Production Manager of WALINGA, Mr. Jacob Thisen visits our company and approves the first national machine with two Canadian components. Then the Vice President of WALINGA Eng. Paul Broekema, visits our plant launching the product in an International Fair. ebm - papst is established in Argentina and CIRIGLIANO is appointed as a distributor of the abovementioned company. The transfer grain machine production of grain for different products is consolidated. 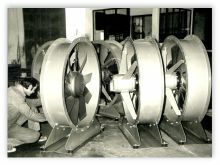 Fans for main mine ventilation is exported. Cirigliano participates in international exhibitions. The company make contacts in Mexico to introduce the drying equipment and Mining operations. New Cosmos programs are installed for the analysis of rotating assemblies. 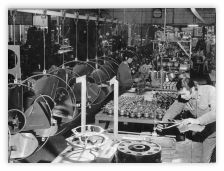 Bifurcated Fans are provided for smoke evacuation in case of fire in department stores and warehouses. A Vertical last generation Machine Center Mark Hass for manufacturing Parts and Matrices is incorporated. Our personnel is trained. 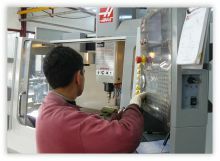 Mr. Gustavo Cirigliano is trained with software for the machine by the personnel of Hass. The Lic. Sergio Cirigliano travels to Italy. The first export of Static drying equipment is made to Italy. In October, Mrs. Ramona Fittipaldi Cirigliano with 100 years old passed away. 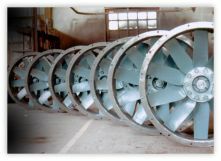 Large-sized axial fans for underground mining are exported. 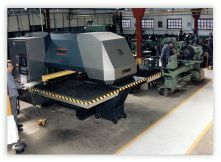 The company incorporates PROCAM 2009 to work with CNC machines. The company builds a new manufacturing hall with a rolling control bridge. The Engineer Andreina Cirigliano joins the technical and commercial sector (4th generation). The company certifies with ISO 9001 the procedure of design, development, marketing, manufacturing and post sale service of axial fans. New matrices for manufacturing low-power electric motors of new technology are developed. Cirigliano is a company dedicated to the design, commercialization and production of fans and ventilation systems for a large industrial sector. Achieve the full customer’s satisfaction as from reliable products that are highlighted by its efficiency. Keep the continuous and fluent communication with customers according to their needs when ventilation solutions are designed as well as in the post-sale. Apply the best productive practices for an efficient production supervision taking early decisions in order to optimize resources. Execute our processes based on the continuous improvement encouraging the participation of all members of the organization when detecting opportunities.